Being a Farrier isn't a job its a Lifestyle..
LLD mare .. notice the difference in shoulder height on the before and after photos. 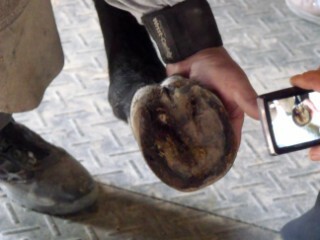 100% sound in three shoeings..
Baby Donkey with a fused hock. A 2 1/2 in lift kit, casted on and in three weeks she is useing her foot to carry weight. Hello some of you may know me, but for those who do not here is the way I think and do. I feel that anyone can make a difference in their own life. Most people hate what they do for a living.. I enjoy mine to the fullest..I have been raising Registered Appaloosa's for 30 years and I feel that they are sound in the mind and very athletic and 90% have color..I have been a photographer since 1983 and this to is enjoyable, to be able to record the future of others along with the past..I have been a Farrier since 1985 and I specialize in LLD horses, to make a horse move in comfort and have a horse that has been off for a few years or months go sound is exciting for myself and the owners..A special Thank You to Dr. Esco Buff for all the education on the support to me and Cole .. I truly enjoy my work.. and indeed it can be stressful at times..i I also munipulate muscle's in Equine for energy movement,and heat healing, .pendelum checking for muscle control. if you horse is sore and not performing at their best give me a call.. This is Blu Neon --bred, born and raised here and is 90% color producing.. A true sweetheart..